Canada was turning 150 and instead of planning an epic party in Ottawa or Toronto, I decided that I wanted to be with my family in Canada. What could be more Canadian than sitting around a campfire with family at the cottage? Little did I know how epic this Canada Day was about to be! On the morning of Canada Day (July 1st), I decided to swim across our lake. We're at the narrowed part of Sandy Lake, so it's only about 800 to 900 m across (about a half mile). Since it's dangerous to swim alone with summer boat traffic, I asked my brother to spot me from the canoe. I figured he and my niece would have a good time, and it's a fairly easy paddle across the lake and back. I gave him my waterproof diving camera so that they could take pictures, and handed him my phone in a ziplock bag to record the route on Strava. I shouted to him to start recording and put the phone in his pocket before I jumped in and started swimming. After that I was completely focussed on swimming. I had my head down in the water, trying to get into a good rhythm, and only came up every now and then to make sure I was on track. I got to the other side without hearing or seeing my brother in the canoe. Standing on the sandbank near shore, I looked back at the cottage and scanned the lake for the canoe - but couldn’t see my brother. I started to get grumpy after a few minutes. "How could my brother abandon me in the lake like this?" I thought to myself. Little did I know that my brother had followed me the whole way but the wind was a lot stronger than either of us had expected and he’d gotten blown downwind. He was just off the shore to my left, but I didn’t see or hear him. He was trying to paddle against the wind, but couldn't stay on course. It was around then that my mother sent him a text message. He pulled out my phone but couldn’t unlock it. When he saw me start to swim back to the cottage he tried to cross as well, but between fighting the wind, dealing with the phone, and a small child wiggling around in the bow, they lost balance and the canoe tipped over! That was a big scare for my brother (not to mention my mother and my sister-in-law who were watching from shore), as my niece was in the front and she ended up under the canoe. My mother rushed to the neighbours to ask for help, while my brother quickly searched for and found his daughter. Fortunately, they were just 200 to 300 m away from the dock of a cottage on the other side of the lake, and a couple of guys from there rushed out in their canoe to help them. I got the whole story only once I’d gotten back to the cottage. My brother was a little shaken up but otherwise ok. My niece was just peachy - she said it was very pretty being under the canoe! Then I realized that they had lost everything. The camera, water bottles, even the towels had sank - and yes my phone too. That's a lot to lose on one canoe ride! After regrouping and having breakfast, we went back on the water - this time in our 14' aluminium boat with snorkeling gear I'd borrowed from the neighbors. After stopping as close as we could to where my brother figured he'd gone over, I started duck-diving. While I couldn't see the bottom from near the surface, if I went straight down I could almost get to the bottom before running out of air. I'm not a very good free diver, but I figured the bottom was about 5 to 10 m down. Too deep for snorkeling, but not so deep that it couldn’t be retrieved. I figured that if I had my dive gear, I'd at least be able to look for the stuff. I also didn't have a dive buddy, and diving alone is on my list of "top ten things to never do." I went over to the neighbors to return the snorkeling kit I'd borrowed, and found out that the person I'd borrowed it from, Russ, is also a PADI certified diver. We figured that we both love diving, and here was a chance to go on a mission, so why not give it a shot? At the worst we'd come back with nothing but have had an interesting adventure under the waters, and at best I could get my camera back, since it's rated to 15 m. I figured that even if by some miracle we found the phone it would probably be dead - a ziplock bag might be good for a splash, but what chance would it have under 10 m of water? Off we went to the closest dive shop, about 45 minutes away by car. They weren't supposed to be open on Canada Day, but they had a weekend course and opened just for us. We grabbed two full sets of gear, including wetsuits, fins, and two tanks each. I also bought dive lights and gloves, since I needed those anyway. We headed back to the cottage with a truck full of gear and excited to go! Once back at the cottage we got everything prepped and loaded into the aluminium boat, and then went over to the other side of the lake. We used the dock of the family that came out to help my brother, as it's pretty close to where we needed to be and we needed their help. We asked them to drop a marker buoy as close as possible to where they figure my brother had tipped the canoe. Rather than trying to enter the water by boat, we figured it was easier to enter the water from the dock and swim out. Under the water things were pretty much exactly as predicted: depth of about 6 to 8 m, visibility around 3 m, sandy / silty bottom, with short weeds over most of it. There were some fish, mostly minnows, and one bigger guy, possibly a bass, that seemed to like to watch us. We started a circular search by sticking one pole in the mud at the spot indicated by the neighbors and tied a rope to it. We then set another marker about 3 to 4 m away, and used the rope to swim a meter or two above the bottom in a circle around the first pole, using our lights to look for anything. When we got back to the second marker pole, we moved it outwards another 3 or 4 m and started another circle. After 20 to 30 minutes of searching, and widening the circle to something around 15 m or so, we found the camera! I clipped it onto my BC, and then we reset the circles and started the search again. After another 10 minutes or so we found the towels and the water bottles! We were definitely on the right track and had already made a huge discovery. We then hit a major problem: I had a buoyancy runaway and floated to the surface before I could correct it. We went down again, but without a line and far too fast, we both hit the bottom - stirring up all of the silt and killing all visibility. Fortunately, we found the towels again and managed to reset the poles, but visibility was much worse than before. It only took a few more minutes to hit the jackpot: the phone! It was on edge at a slight angle with the bag intact. Amazingly, the screen turned on when we picked it up! The pressure had pressed the plastic of the bag in a perfect seal around the phone and made it waterproof. Even more impressively, the “find my phone” feature I’d tried to use earlier made it start ringing when we brought it to the surface. It was alive, and fully functional! After bringing our bounty back to dock, we thanked our neighbours profusely. As much as the search technique worked well, we would never have found everything without the excellent starting point they'd give us. I'm still amazed that not only did we find everything, but that the phone worked. 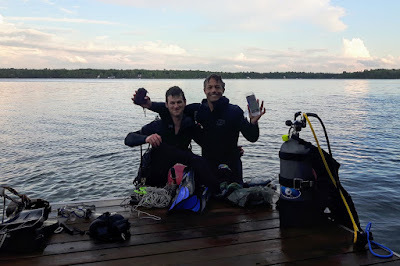 That was a terrific adventure - and the dive gear rental more than paid for itself! - though if I had to do it over again, I'd rather avoid the problem in the first place. Remember: never text and canoe!